A lot of you know (if you’ve read my bio or heard me speak) that before I was published I spent ten years writing and not-writing and making excuses and writing badly and very slowly and not-writing some more and whining and writing for six years on a really awful, long, dreadful historical, then on a short contemporary, then on another historical set in Medieval England, then on another contemporary … then all of a sudden, the historical set in Medieval England sold and I was a published author. It’s easy. One minute I’m writing on my fourth book because by now I’m convinced I’ve died and gone to unpublished hell, and the next the phone rings (on Friday, February 2, 1990 at 3:30pm, but who’s counting?) and I’ve sold my first book. That book was CANDLE IN THE WINDOW. The first print run (the number of books printed to be sent out to the market) was 25,000 — a really, really low number. The advance was $5,000 — also a really, really low number, especially if we figure a 40-hour week x 52 weeks a year x 10 years = 20,800 hours. We then divide that by $5,000 and realize that my salary for that ten years, I made a whopping 24 cents an hour. Do I have a point other than to make you giggle? 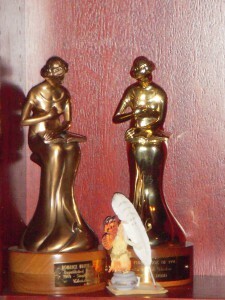 In February 2007, after almost sixteen years of being in print, a Golden Heart award, a RITA award, a Romantic Times award, and its third, brand-new cover, CANDLE IN THE WINDOW was re-released. You know what else happened in February 2007? 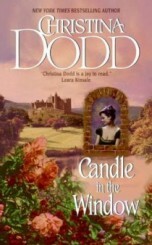 On February 28, the same day I heard that TONGUE IN CHIC was on the New York Times bestseller list for the third week, I also discovered that the reprint of CANDLE IN THE WINDOW was on the same New York Times List. TONGUE IN CHIC was my thirty-first book, and it was on at #12. Thank you so much for your wonderful support and your inspiring fan letters. I write for you, and that day was one of the happiest of my life. Sometimes, that’s exactly what it takes.